Contemporary trends in urbanisation around Hammarsdale and surrounding areas has resulted in a paradigm shift from the rural traditional subsistence form of agriculture where a rural producer had the ultimate decision regarding the choice of crop to produce; the quantity to be kept for home consumption; and sales at their local market place to a more modernised form of production where a farmer produces not only for consumption but for commercial purposes. This trend has resulted in rural farmers having to venture a far in search for favourable markets and opportunities to grow high quality crops. As food consumption patterns becomes more sophisticated, food supply systems have developed into channels requiring more sophisticated arrangements in terms of transportation, storage, packaging, wholesaling, retailing, etc. – from the point of production to where the fresh produce reaches the market. Giving the seasonal nature of rural agriculture, compounded with the limited access to market information, there is often a lag time between when these rural farmers may observe a market opportunity and their ability to respond to such opportunity. Consequently, farmers tend to miss important market opportunities. In light of this, the project team conducted a market scoping exercise to understand the market environment within which farmers in the Hammarsdale area are operating in. This was done in order to create associations between farmers and previously inaccessible formal markets to ensure project sustainability post funding period. This market scoping report was compiled using information gathered from farmers and retail facilitators within Hammarsdale using survey interviews. Farmers were asked to identify the current markets available for selling produce; information on prices offered; and the challenges they faced when accessing these markets and future opportunities. Whilst retailers were asked of their potential interest in the programme and their willingness for an uptake agreement with farmers. A total of ten formal markets within the Hammarsdale area were approached in total. All of which were receptive and willing to become potential markets to support the farmers. Table 1 gives an outline of the stores visited and the potential product list to be sourced from farmers. The challenges of poor economic geography is seen to reduce the ability of Hammarsdale Farmers to successfully compete in domestic and formal markets. For these farmers, it is often difficult and costly to access appropriate information on market demands which is necessary to produce the right product and to supply products that are in demand. The incentive for farmers to enter these markets is therefore lacking and Hammarsdale farmers are often faced with the risk of not having enough; not having the right information; as well as being taken advantage of by opportunistic behavior by the buyer. Buyers often, in the informal sector, tend to provide farmers with information on market demand through their purchasing behaviors which is often to their advantage and may reinforce exploitative behaviors. In addition, these farmers are at greater risk due to their low resource endowment and the fact that they are often faced with highly vulnerable production risks due to natural conditions and climatic shocks. Water availability and supply has been identified as one of the most challenging climatic issues experienced by farmers. The effect of this has resulted in some farmers cutting down on land production size to smaller manageable sizes. As a result of these barriers, some farmers prefer to enter into transactions with members of the local community, with family members or persons they have known for a long time to reduce transaction cost. Social mechanisms of reputation, social sanctions and informal information exchange thus reduce the transaction costs related to uncertainty, asymmetric information and transaction risks. Trust therefore plays an important role, as it reduces trading risks. However, being limited to trading partners with whom a long-term relationship has been established reduces the scope of farmers increasing trade by selling to other markets. Currently, the Do Good market has been the main formal market channel for farmers, which encourages farmers to increase their supply for more formal markets. 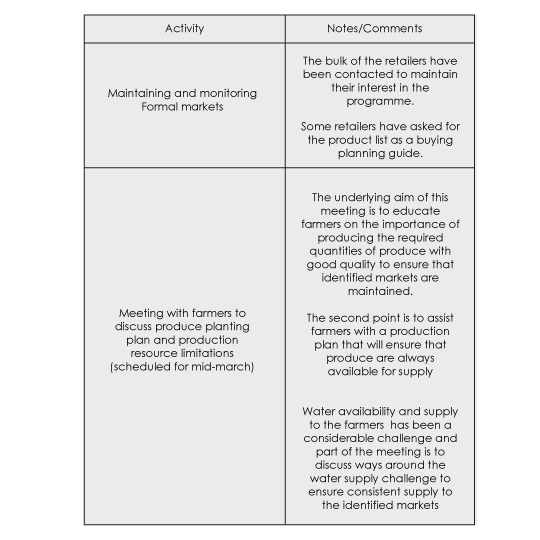 Table 2 summarises the planned activities ahead to ensure that markets are maintained and that farmers are capable of supplying the required quantities of produce. As of March 2018, through contacts with the Agribusiness Development Agency(ADA), the team has been negotiating the possibility of having the farmers to supply Nando’s head office alongside other smallholder farmers through the Agribusiness Development Agency. A meeting is to be scheduled by mid-march for the ADA to access and view the farmers’ capacity to supply fresh produce in the Hammarsdale region. Talks around this market are ongoing.